Hanoi. As our plane was landing, I’d really done no research, and I had no idea what to expect. A lot of things I’d read suggested that Saigon was really where it’s at, and that Hanoi was more drab, less cultural, less romantic. I wondered aloud to Page if perhaps we were making a mistake by going there, that perhaps I wouldn’t enjoy it at all. I had the time of my life in Hanoi. Something about the city and I really clicked. Clearly, a lot of it was the food, which I’ll get to in a bit. But, it wasn’t just that. There’s something about the city. Nearly everyone who visits stays in the old town area, but it’s not a cordoned off Ghirardelli Square-like contraption, or some Colonial Williamsburg spin-off. It’s very much alive, and no matter how many white-dreadlocked hippy backpackers show up, there’s far more locals. It’s a hive of specialized shops, streets devoted to doorknobs or purses or dried fish, and all that life is spilling out onto the streets at every corner, with vendors, food stalls, and just people hanging out. Beyond that, there’s a lot else going for it. The city is quite pretty. The lake of the old market area, Hoan Kiem, is beautiful, and there’s a lot of other lakes and parks across town. The city is surprisingly walkable, perhaps the most walkable we’ve been in Asia yet. Everyone we met was tremendously friendly and kind, and it often didn’t feel like like a weird service relationship (which is mostly what you encounter in Asia as a white ATM). There’s a number of fun activities, too. The Ho Chi Minh Museum, with accompanying hoverport, definitely opened my eyes to the Power of Communism like no other. The Museum of Ethnology was perhaps the best done museum we’ve seen in Asia yet: well organized, informative, crazy awesome structures, and the first place that I felt like I was able to get a grip on what the quilt of cultural-ethnic groups of SE Asia are like. Plus, the 8,000 thirteen-year-old school children there really liked Page. I mean, really. Cha Ca: Cubes of fish, fried dangerously at your table with mega dill. Banh Cuon: The slippery dumplings with soup and crunchy fried bits of your dreams. Bun Bo Nam Bo: Beefy beefy mega-beef noodle comfort soup. Banh My Doner: Contender for Page’s favorite food of the trip. Cinnamon melty fat mayo-spicy goodness. Mien Xao Luon: You didn’t know cellophane noodles could be this hot goody dangerous crab yes. As well as a ton of amazing renditions of dishes that I already knew. More than anything, though, my favorite moment in Hanoi was having Bia Hoi Ha Noi on street corners. This is a essentially local, essentially Hanoi thing to do. Thanks to some beautiful happenstance (thanks, Sandals Guy), a Czech brewer introduced beer brewing in Hanoi in 1960 or so, and hit upon a great recipe for a pilsner-like brew that seems to cry, to weep, to be served out of a keg. So the people obliged. And all over the city, there’s a culture, unlike anywhere else I’ve seen yet in Asia, of Bia Hoi vendors, which just set up shop on a busy street corner, with a stack of red plastic chairs, and serve the beer by the mug, out of the keg, made fresh from the brewery that day, for a quarter a glass. Every corner is a Zeitgeist, and every corner is full of locals and meanderthals alike. And it’s beautiful. 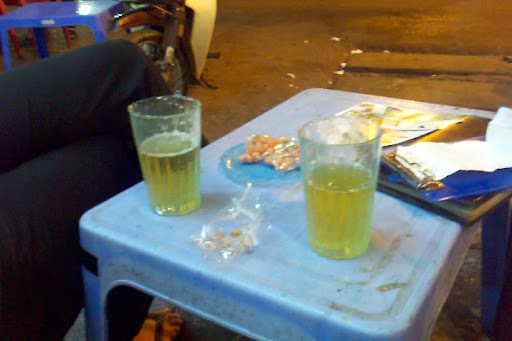 You can just sit on a maze-like street corner of the old town, enjoying some peanuts or sunflower seeds, with your cold mug of clear-yellow-almost-green Bia Hoi Ha Noi, watching the world go by, not a care in the world. And when the lady asks if you’d like another mug, you’ll say yes.